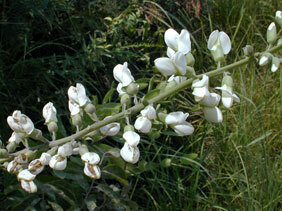 Also Called: Atlantic wild indigo. Stems: Erect, solitary with ascending branches, glabrous, waxy. Leaves: Alternate, 3-foliolate, on stalks 1/5 to 1 inch long; stipules 1/5 to 1.2 inches long, lanceolate to ovate, usually falling before or during flowering; leaflets narrowly egg-shaped, oblanceolate, or elliptic, 1 to 3 inches long. Inflorescences: Racemes, 1-several, stout, terminal; central one 8 to 24 inches long. Flowers: Stalks 1/8 to 1/2 inch long; bracts ovate-lanceolate to lanceolate, 1/4 to 1/2 inch long, usually dropping before or during flowering; calyx tube 1/3 inch long, 2-lipped, upper lip entire or notched, lower lip 3-lobed, lobes triangular; corolla papilionaceous, white; banner 2/5 to 3/5 inch long, shorter than wings; wings and keel straight, 4/5 to 1 inch; stamens 10, distinct. Fruits: Pod, ellipsoid-oblong, 1/10 to 1/5 inch long, glabrous, drooping, black when mature; tip narrowed to short beak; seeds olive to yellowish-brown, covered with wart-like projections. Distribution: Principally in the east 1/3 of Kansas, but occasionally further west.